A victim advocate is a liaison between a crime victim and criminal court. The advocate has primary concern for the victim and advises the victim on what to do as the criminal justice system works through its processes. Victims need to understand their legal rights and to be aware of what will happen next as their case is adjudicated. Victim advocate jobs can be very rewarding. Crime victims are traumatized people. They do not elect to be crime victims and have been thrown into a chaotic situation without their consent. Certainly, some crime victims contribute to the situations they find themselves in, but many are simply in the wrong place at the wrong time. During a police investigation and subsequent trial, victims must relive their trauma for the criminal justice system to work. Victims must recount their version of events in police interviews and court testimony. Advocates do all they can to mitigate the effects of rehashing the trauma. Victim advocates are employed by police departments, prosecutors’ offices, criminal courts and nonprofit organizations. Other than the ones who work in nonprofits, advocates are selected through the normal government hiring process. These positions may require more extensive background checks than most other government jobs given the sensitive and confidential information victim advocates access in their daily work. Most postings for victim advocate positions require a bachelor’s degree with some relevant experience. A master’s degree is preferred. Victim advocates tend to have degrees in social work, psychology or criminal justice. Bilingual skills are a plus, especially in geographic areas with diverse populations. Victim advocates have a range of duties, and all of them are geared toward helping crime victim cope with the trauma that the crime has brought about and navigate the criminal justice system. Victim advocates counsel crime victims and witnesses. 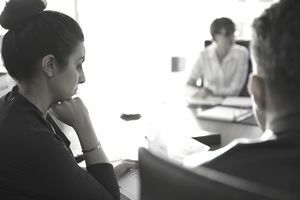 Advocates are well-versed in counseling techniques and apply them to chaotic and stressful situations. Victim advocates primarily counsel people in their offices; however, police officers, detectives, and crime scene investigators may call victim advocates to a crime scene to counsel individuals mere minutes or hours after a crime has taken place. Victim advocates may be scheduled for on-call duty on a rotating basis to deal with such situations. Such a schedule means that advocates can rest assured that on most nights they won’t be called to a crime scene at 4:00 a.m. When crime victims need services that are beyond the advocate’s ability to provide, the advocate refers the victim to other government agencies or nonprofits that have the expertise and capacity to provide the needed services. Victim advocates maintain strong working relationships with staff at providing organizations. Advocates continually recruit providers to expand the breadth and depth of available services and to mitigate impact when an existing provider experiences budget, staff or volunteer reductions. Victim advocates keep statistics on the people they serve and the services they provide to them. These statistics help advocates and their management develop budgets, allocate staff and plan contracts. Statistics are also provided to other entities such as courts, police departments, and researchers. Victim advocates usually earn between $40,000 and $45,000 per year. This salary is comparable to what experienced social workers earn in most states. Individuals with a few years of social work experience could make a sizable pay increase switching from traditional social work to victim advocacy.